I’m a bit late this year with my “annual” Homegrown Harvest gardening post. The quotes are because this is only the start of the third year since my hubster and I put a raised garden in our backyard, and only my second annual gardening recap. When we originally put in our garden, we weren’t sure if we had green or brown thumbs. But we decided to give it a try. That first year, the garden was almost comically overcrowded (more on that here), but we did get loads of produce from our homegrown harvest—in fact, we were giving away cukes and tomatoes because we couldn’t keep up with them! Last year, I thinned the garden out significantly, getting rid of sprawling plants like squash and zucchini (besides, my neighbor down the street grows ginormous ones and always gives us a few!). Phil and I both turned over the soil in the garden carefully, and then I set to work planting everything and arranging tomato cages. As it turned out, we didn’t dig deeply enough. As I pushed my final tomato cage into the soil, I felt a distinct, ominous “clink.” I tried moving the cage slightly and twisting so that the prongs could slide past whatever wayward stone they were hitting. Pffft. Nothing worked. Finally, I gave up, dug out the poor tomato plant, and started digging down to find whatever was lurking beneath the surface of the soil. Okay, okay, I exaggerate. But at the time, I was fairly certain that if I dug down far enough to find the base of the rock, I might find myself swimming in the middle of the Indian Ocean. I was completely flummoxed as to how I’d get it out. That’s when my lovely neighbor came to the rescue and helped me lever the gigantic rock out of the gaping hole, which took a good hour. Then I rolled the thing off to the side of the garden, where it sits to this day. Adventures in excavation. Removal of the “boulder” lurking underneath my tomato plant was quite the undertaking (actually, a boulder and a large rock). Left, the boulder in its hole. Center, the boulder and rock with a wee tomato plant in the background for perspective. Right, the unearthed behemoth(s). I deserved a beer after this! Last year’s growing season was challenging because the tomato plants were stricken with blossom end rot. I thought I had some lovely, ripe Roma tomatoes—until I picked them and got a look at the apex, which was completely black and gross. I thought the tomato harvest was torpedoed for sure. But then, I did some research on the interwebs: that Google knows everything, doesn’t it?! I found out that blossom end rot resulted from calcium deficiency, and that fixing the problem was a simple matter of spraying the plants with a calcium solution. My traumatized tomatoes recovered and made up a truly impressive portion of our homegrown harvest. 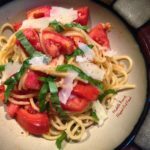 I made three batches of easy, slow-roasted tomato sauce, which I happily pulled out of the freezer in the middle of winter for a variety of fresh-tasting pasta dishes. Big tomato harvest: Left, tomatoes waiting to be popped into the oven for a slow-roast. Right, freezer containers full of scrumptious marinara sauce. When I say 3 batches, I mean that I did the operation in the pictures above three separate times. Besides the tomatoes, it was a great year for peppers, which I used in salsas, Asian dishes, and jerk sauce. The Thai basil also grew like crazy (thigh-high! ), which is great because the hubster and I both love Thai basil in Thai Green Curry, Stir-Fry with Thai Basil & Peanuts, and Pho. The growing season in Wisconsin starts a lot later than other regions, so I almost never plant before Memorial Day Weekend. This year, Phil and I carefully tilled the garden and applied Preen (for the weeds, which were out-of-control last year) and Vigoro (a tomato fertilizer). The weather was very cool up until mid-July, so my tomatoes and peppers have only just started taking off. The Thai and sweet basil are still trying to go to seed about every five minutes, so it’s challenging to keep up with them. Other than that, so far so good—we can’t wait for our homegrown harvest to start pouring in! 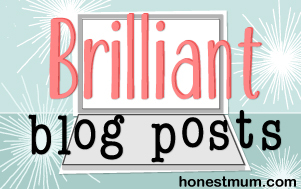 I’m thrilled to be linking this post up to #BrilliantBlogPosts over at Honest Mum. You can check out the fun here! Tomato-Basil Pasta: a fresh, healthy meal that’s done in the time it takes to boil pasta! A celebration of the tomatoes of summer. 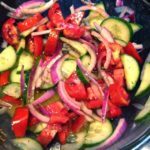 Cucumber-Onion-Tomato Salad: A cool, light salad that comes together in less than 10 minutes. Pairs well with spicy dishes. 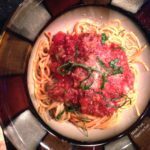 Slow-Roasted Tomato Sauce: An easy recipe for classic marinara sauce with a complex, slow-roasted flavor. Great over pasta, or as the base for Bolognese Sauce. Freezes well for an easy meal anytime! 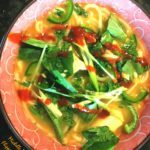 Pressure-Cooker Pho Ga (Chicken Pho): Pressure-cooker pho delivers a rich, flavorful broth in a fraction of the time. Piled high with beautiful garnishes, this healthy soup really satisfies. 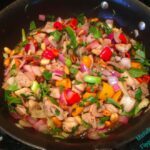 Stir-Fry with Thai Basil & Peanuts: This easy, healthy stir-fry recipe is loaded with veggies, herbs, and peanuts, and accentuated by a delicious sauce. I already miss tomatoes, adios dear, sweet and plumb old friends. Enjoy your canned harvest for now, until next year. Thank you, Christina! I do too…and I’ve already used some of my canned harvest! We were late putting in our garden here in Virginia but it’s doing well now. So hot but the squash and tomatoes are coming in. Love all these recipes – and must give some a try! Great job! Thank you, Tricia, and good luck with your garden!! While summertime is prime growing season everywhere else — in South Florida it’s too dang hot! Even the plants want to chill in the air conditioning! Those ‘maters look outstanding though. Nothing like home grown! Thanks, Lisa! You’re on the other side of the growing season spectrum: I imagine that’s very challenging! I agree: homegrown is the BEST. Ah, I’m so in awe of your gardening skills! I have the blackest of black thumbs, so growing *anything* yourself is super impressive to me. Love all the things you’ve made with your harvest, as well – especially that tomato-basil pasta and tomato cucumber salad! Thank you, Monica!! LOL, “black thumb”! Sometimes (like with the tomato end rot), I wondered if I shouldn’t just pack it in and resign myself to farmers’ market and canned tomatoes. I can sympathize! These all look so lovely and fresh! Growing your own is so worth the challenges. I only have a little veg plot 3 foot by 6, but it does well. Tomatoes always get blight for me though, and here in York UK we’re a bit far north to grow them without a greenhouse. 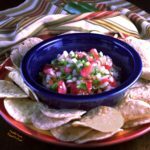 That pico de gallo looks so fresh and tasty! That’s amazing that you grow tomatoes in your garden, we need to start doing that as well. Thanks, Diana: it’s worth it!